Martin Luther King, Jr., giving the "I have a dream" speech. 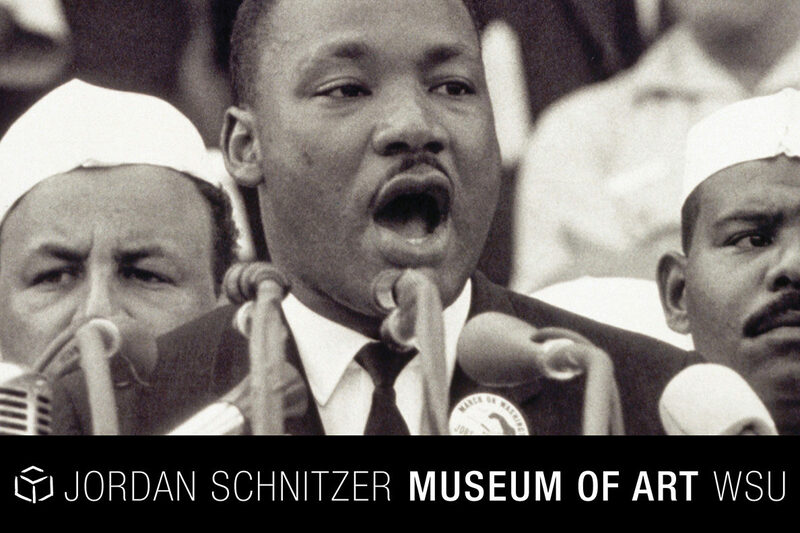 PULLMAN, Wash. – The Jordan Schnitzer Museum of Art at Washington State University Pullman is hosting a reception and celebration for Black History Month, 5–7 p.m. Thursday, Feb. 7, in the Pavilion, Bruce/Floyd and Borth Galleries. The event will feature a lively discussion and gallery talk with special projects curator Sidney Murphy, who will introduce the work of African American artists Mark Bradford, Leonardo Drew, Julie Mehretu, and Wangechi Mutu. Participatory events with multiple WSU student artists are planned to surprise and intrigue audiences. Admission is free, and everyone is welcome. Refreshments and a variety of light fare will be offered. The Jordan Schnitzer Museum of Art WSU is located in the Crimson Cube on Wilson Road across from Martin Stadium and the CUB, on the WSU Pullman campus. The hours of our six galleries are Tuesday–Saturday, 10 a.m.–4 p.m., closed Sunday and Monday. For more information please contact the museum at 509‑335‑1910.